Author Michael A. Jefferson re-imagines civil rights and reconstruction eras in new book. 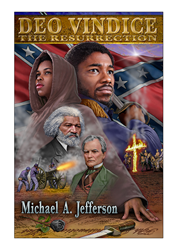 "Deo Vindice: The Resurrection" written by Michael A. Jefferson, takes the reader on an alternate historical fiction time line. The novel begins in 1964 and later to 1868 where the narrative unfolds and the question "what if...?" is answered. In 1868, Benjamin “Bluff” Wade is President Pro Tempore of the United States Senate. After the impeachment and subsequent conviction of President Andrew Johnson, Wade assumes the presidency due to a never-before-used constitutional quirk. The new president is determined to implement his newly drafted Fifth Reconstruction Act. This Act authorizes widespread reform in the social, political and economic life of citizens in the former Confederacy. The Act also approves the militarization of blacks living in those states. The book follows the career of a young math prodigy, Lisa Stewart, who grew up to become an exceptionally brilliant and strikingly beautiful change agent. Stewart’s efforts are supported by Aurelius Foginet, an unassuming military and political genius. With Stewart at his side, the powerful and determined black duo, along with a very capable black political organizer, Randall McArthur, who happens to be gay and the elite troops of the feared Southern Guard, attempt to establish a safe haven for blacks in the former Confederacy. Michael A. Jefferson is a practicing attorney and a former radio talk show host. He is the founder of the Kiyama Movement - a movement dedicated to promoting self-improvement among African American males of all ages. He is a life member of the Omega Psi Phi Fraternity, Inc. and presently serves as the District Representative for the organization’s New England Region. In 2015 he received his 4th selection as one of the 100 Most Influential Blacks in the State of Connecticut by the NAACP Connecticut State Conference. He lives with his wife of twenty seven years - Pamela Augustine. The couple has two sons Michael II and Malcolm-Fidel.